Part I focuses on the core problem that, despite the obvious need to rethink political community ‘beyond’ the nation state, our conceptual language is still thoroughly shaped by modernity, its prioritisation of the state and sovereignty, and its assumption of unifying progress in history. Part II focuses on postmodern political community, these chapters take up the calls made above for new thinking about political community that goes ‘beyond’ modern conceptions. Part III turns to the question of the emergence and decline of new forms of political community. 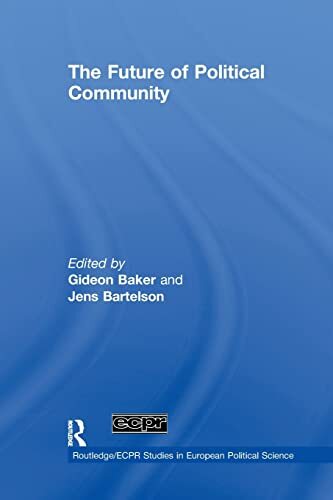 The purpose of this section is to consider how the transformation of political community occurs in practice, and what the primary driver of this change is globally, locally and historically. This book will be of strong interest to students and scholars of International Relations, Political and Social Theory. Jens Bartelson is Professor of Political Science, Lund University, Sweden. He is the author of A Genealogy of Sovereignty, Cambridge University Press (1995), and The Critique of the State, Cambridge University Press (2001). Gideon Baker is Senior Lecturer in Politics and International Relations at the University of Lancaster. He is the author of Civil Society and Democratic Theory: Alternative Voices, London, Routledge, (2002) and co-editor of Global Civil Society: Contested Futures, London, Routledge, (2005).